A sign placed out on the 16th Street Mall beckons people to sign up for health insurance through the Affordable Care Act. 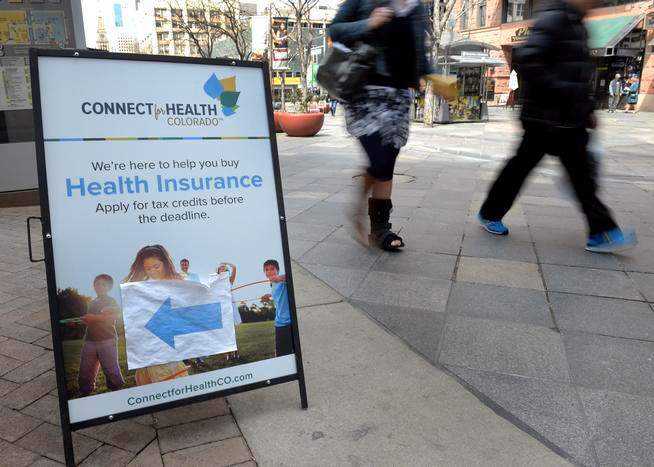 Lawmakers are considering a performance audit of Colorado’s health exchange. DENVER – Following a blistering report released in December, lawmakers Wednesday offered bipartisan support to a measure that would require extensive audits of Colorado’s online health-insurance marketplace. The unanimous vote for Senate Bill 19 by the Senate Health and Human Services Committee reflects a change in tone after Senate Democrats last year killed a similar measure that would have required an audit of Connect for Health Colorado. The measure this year would allow the state auditor to conduct a performance audit and submit a report to lawmakers. The bill was amended Tuesday to extend the audit to other state agencies when they overlap with the exchange. The report released by the auditor’s office in December highlighted problems with dozens of payments and reimbursements. But Auditor Dianne Ray said her office was unable to conduct a complete review, including effectiveness of the exchange’s website and grant programs, eligibility-determination processes, marketing practices, fee-setting methods and long-term fiscal stability. “We did not receive that authority (last year) so we continued with the limited performance audit authority that we had,” Ray told lawmakers. For Sen. Kevin Lundberg, R-Berthoud – who opposed creation of the exchange in 2011 when a bipartisan bill was up in the Legislature – the extensive audit requirement is a necessary means for transparency. “There are better ways to deal with the medical insurance issues for the people of Colorado, but this is the system that has been placed into effect, and I believe the state auditor should have the ability to determine just how the performance is working,” Lundberg said. The measure even had support from exchange officials themselves. Interim Chief Executive Gary Drews said his organization is taking the audit findings and request for transparency seriously. “We, as an organization, do want to be transparent and improve our operations at every opportunity,” Drews said. Sen. Cheri Jahn, D-Wheat Ridge – who carried the measure along with Sen. Jerry Sonnenberg, R-Sterling – applauded exchange officials for their support. But Jahn said the Legislature must act to ensure the system’s stability. “Our job is to make sure that this works really, really well, because this needs to be a success,” Jahn said. Sen. Linda Newell, D-Littleton, explained that she was unable to support the audit bill last year because she didn’t believe enough time had passed to conduct a comprehensive investigation. She supported it this year.